Open source, with no strings attached. Support for multiple transceivers. 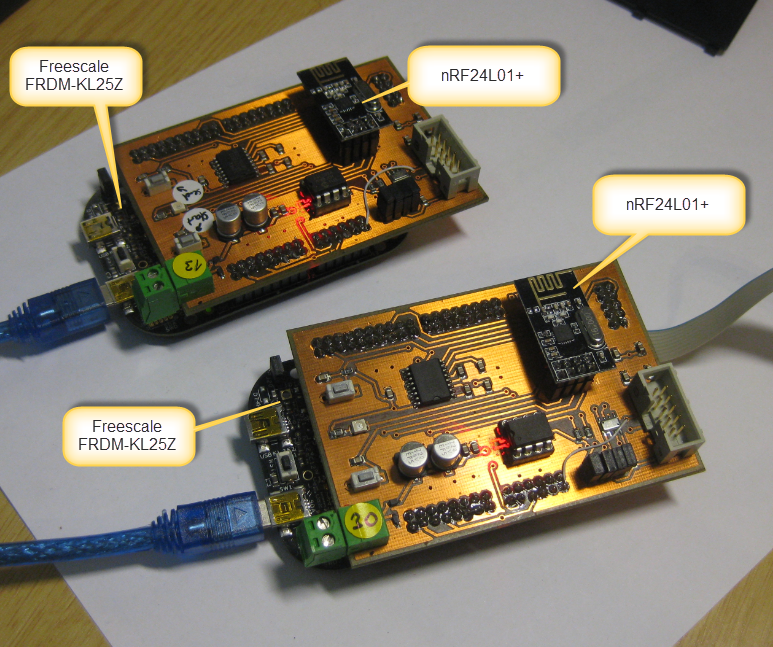 Initially designed for the Nordic Semiconductor nRF24L01+, but it shall work with the Freescale MC1320x too. Optional command line Shell interface. 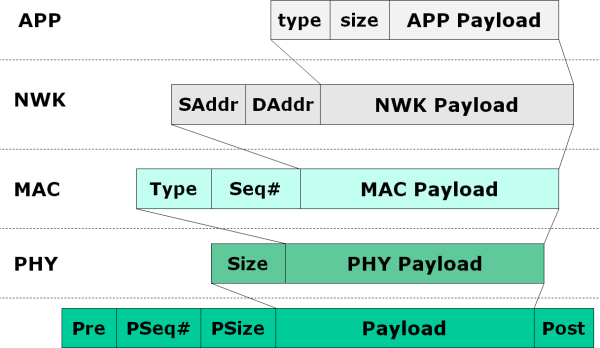 Using a simple layered architecture: Radio interface, PHY, MAC, NWK and APP layers. Optimized for small networks (8bit or 16bit node addresses). Acknowledge message handling on higher stack levels. Working with FreeRTOS operating system. 💡 I’m using FreeRTOS in the stack because it was easy and convenient to implement the stack with it: the RTOS provides services like queues and message processing. Clearly, an RTOS is not a must, but makes things easier. Once I find time, I will update the stack so it works in bare metal (no RTOS) mode as well. Demo project for the FRDM-KL25Z is available on GitHub. The network stack files are on GitHub in the RNet folder. Use one or the other in your application. Each driver implements a local task RadioTask() which processes the transceiver state machine and handles incoming and outgoing messages. The radio task uses the RMSG.c to queue incoming and outgoing messages. FreeRTOS message queues are used to store the data. RPHY.c and RPHY.h implements the functionality to deal with the physical (raw) data packets. All what it does is to send and receive packets to the message buffer which then are processed by the radio transceiver driver. 💡 The stack avoids to copy the data between the stack layers for efficiency. For example RAPP_BUF_TYPE() is a macro accessing the physical (raw) data buffer. 💡 The stack currently supports both 8bit and 16bit addresses, controlled by the RNWK_SHORT_ADDR_SIZE macro. Of course instead using the shell it is possible to send data directly by the application, e.g. sensor data or commands. Using variable payload for the nRF24L01+ (I have variable payload implemented for the MC1320x). Network address assignment and using the Freescale ARM UID (Unique Chip Identifier). Implementation of a generic socket connection (I already have standard I/O redirection implemented). Routing of messages (now it is a peer-to-peer network). Removing the need for an RTOS in the low-level driver. This entry was posted in Boards, Embedded, Embedded Components, FreeRTOS, Kinetis, KL25Z Freedom Board, Processor Expert and tagged Building, Embedded Component, freedom board, FreeRTOS, Freescale, KL25Z Freedom Board, open source projects, Processor Expert, RNet, software, software project, technology by Erich Styger. Bookmark the permalink. Congratulations on your development, I think I will use it. Your prototype operates between two nRF24L01+ cards. It remains to develop if multiple cards with the problem of priority access to the bus and avoid collisions. One possibility is to use a Master / Slave protocol such as MODBUS (which is 40 years old). The multi master protocols are more fashionable but more difficult to implement. LONWORKS (LONTALK) is a very good protocol, but can only be used only with the NEURON CHIP designed by ECHELON. I have an idea for a similar multi-master protocols (almost the same), but much simpler. Just a heads up, but you do not need a Echelon Neuron chip to implement LON. At one time that was necessary, but not any longer, although I believe most still do use the chip. Loytec does not use the Neuron Chip and they Support Lon. Have you liked at the Contiki-OS project at all? I Would be interested in your thoughts! yes, looked at that Contiki project, and indeed, this one is very intersting. But I do not need to run IP on my small network, so I do not need Contiki. The other thing is: I’m not a fan of a tight integration of a network stack with an OS (like tinyOS does as well): I rather want to have the stack and the RTOS separate. But what I have in mind is to run Contiki on a ‘aggregator’ node which then would interface with the internet and include smaller network nodes running an nRF24L01+ transceiver. I still waiting for the nRF24L01+ board. when i get this i will test your code right way! cool! Make sure you check out the latest version of the stack from GitHub as I’m constantly updating it. make it some components will be more helpfull and save lot of time in future. yes, I have looked at RT-Thread, but it is not really an option: first it is less widely used than FreeRTOS, and second the licensing terms are restrictive: as such, I cannot use it for my projects, and if I would do so, the licensing terms make it hard to use. I prefer a much more open license like the MIT one (http://opensource.org/licenses/mit-license.html). What is your concept about power management in this network? Do you plan to do something that will allow the nodes to sleep during most of the time? I mean timed wake up for receive check? This can be done only on protocol level, so it is up to you to decide about it. It is a mandatory feature for battery operated nodes. a) that the routers need to be always on, while the edge nodes can be in low power mode. The edge nodes would wake up and initiate the data transfer. The advantage is that the edge nodes (e.g. a sensor node) can be sleeping as long as it wants. But the router cannot contact the sensor nodes as communication will not be possible if they are sleeping. b) using a beacon mode as e.g. in IEEE802.15.4: there will be a short time frame (configurable, e.g. every minute) where nodes can wake up and start communcition. Nodes would need to sychronize on that beacon because of possible clock drifts. I plan to implement first a) (as this is what I need). Will see if I will go to b) as well. I see additional problem with a) – there will be a collision if two nodes attempt to transmit at the same time. But surely it might be a solution to start with. There is always the chance for collisions in wireless networks: no way to avoid it, so the stack has to deal with it. Luckily, typically the PHY has a built-in ‘listen and retransmit’. Yes, it is a common problem, but one to deal with. I am curous what version of CW you used with your RNet stack? I ask, as I downloaded the code from GitHub and when I import the project (FRDM_KL25Z and Freedome_NRF24L01) into CW 10.5 I am getting 8 errors which do not make sense (cannot find cpu.h, etc)… Is it possible I must maintain the same project path that you have used? I’m using 10.5. this is a Processor Expert project. The missing Cpu.h tells me that you have not generated the code. With Processor Expert it generates additional sources in the Generated_Code folder inside your project. Right click on the ProcessorExpert.pe file in your project and select ‘Generate Processor Expert Code’. I hope this helps. Thank you for the prompt response and the info! I thought I did this, but perhaps I did not… my brains/memory is not like it used to be… alas… regardless I will report back with the results. Sadly, I am still having issues. It looks as if there is a shared resource between the LED1:DSC_LED and RF1:nR24L01 components. In particular the BitIO_LDD item which has an error stating ” error in inherited Component Settings”. Within the NRF1 components the BitIoLdd1 states “component name conflicts with another source code module name”. I spent some time trying to figure out why this is, but can’t seem to get anywhere, as my familiarity with Eclipse is not overly vast. Any suggestions you can offer? If you have an issue with DSC_LED, then this typically means you have not imported all *.PEupd files from https://github.com/ErichStyger/mcuoneclipse/tree/master/PEupd. Are you sure you had imported both Part1 and Part2 files? I did import both parts and I tried it again and I had the same errors. I then deleted the entire project and then re-imported the project and now those errors disappeared. So, it would appear as if there was something amuck with the component importation and the existing project. Now I can correctly generate the processor expert code (yippee! ), however, I get a error that the compiler cannot find the “Rstack.h” file. Upon investigation it looks like the linked resource path is the culprit… I will modify this and I suspect all should be fine. I will report back with the results! The projects on GitHub are using a shared ‘RNet’ folder with the stack files. Make sure your include paths are pointing to it. The fact that Rstack.h is not found let me think that your include paths have not been set up correctly. That was it…I had to modify the project build settings to include the “RNET” Folder and subfolders to the “include” paths. Effectively, my importation target location did not match up with your initial include paths. ah, you found it :-). Once the stack is more complete and stable, I plan to implement it as a Processor Expert component. That way such problems will not happen any more, as the stack sources will be generated with the project sources. Sorry about the troubles! No apologies are necessary, as the troubles were my own. In fact you are and always have been very gratious with your time to assist and respond to those in need and for all of us, I say thank you ever so much! Hello Erich, as my next step i am trying to run the FRDM-KL25Z_RNet. But how do i put the stack into the example? it’s not clear. Other issue is that we have to update the FRTOS calls for the new version. thanks for the note about the new FreeRTOS and the warnings. I have fixed that and put the new files on GitHub (https://github.com/ErichStyger/mcuoneclipse/commit/dbb204b5ca94ef8c8fe11bdda5cd399d09b8812f). So you need either change the path settings and the links in the project, or to use that directory structure. Dear Erich. What about your develop Stack? As I understood, you build the stack is base on only 1 hardware address, both for TX and RX? few days until now, I’m thinking so much about the network use nrf24l01+, but with enhance shockburst, for 6 pipe for one note. we can use to dev app to register node, or release net. what do you think about this? Not sure if you have seen the follow-up posts on this topic. The stack has been eveloved a bit. But you are correct: all nodes in the network are using the same hardware address. I was looking into the 6-pipes modle Nordic is suggesting for this. But my experience and as well with the feedback from other companies I came to the conclusion that the pipe and sub-node-pipe model is not robust enough. You might have a look at http://maniacbug.wordpress.com/2012/03/30/rf24network/. I had looked at this stack, and that’s probably what you are looking for. However, I decided against it as the license behind was not open enough for me. But it might be ok for you. I had read your link before. And try to deep understand code of maniacbug. You can download maniacbug github project to view deeply. Actually, maniacbug just build the network with only 1 hardware address, you can see in the “struct RF24NetworkHeader”. accidentally, 6 child node make confuse with 6 pipe. @@. I’m working with 2 pipe ok, pipe 0 and pipe 1. But the others be don’t work. Maybe need to work more. I have something to confirm again. YOU’RE RIGHT. The code in the link you share send to 6 pipe – 6 hardware address. Base on the address will choose pipe to send. – The others transmit the package send and ACK. But, I have some problem. Because they have the same Hardware address (1 pipe). Therefor, after “Node send” send out the “package send”, the others node transmit the “package send” with the same Hardware address, It make “signal on air” not right, and the “Node receive” and “Node send” can’t get the package. It’ happen if amount of “The others” >=3. It’s like the situation of 1 Node will receive package of multi node (>=3) at the same time==> It can’t get anything. Hmm, that indeed could be a cause of problems: using the same pipe for many devices will create ACK conflicts. I have used the network with many devices and the same pipe, but there was one master, and the nodes were sending/communicating sporadically and random, so I have probably not seen that problem, or got recovered with a re-transmit. There’s a small problem in the components files from 2014-11-16 if you are developing on Linux (where file names are case sensitive). many thanks for reporting that issue! I have fixed this on GitHub (https://github.com/ErichStyger/McuOnEclipse_PEx/commit/3a038a87c8f0c9ba9f788594b0ffb8c091fd7998) so you can easily apply this to your local sources. I plan to release new components probably in a week or so, but until then can you use this fix? I’m yet to work out how to use those PEx sources. In the meantime just creating a link RAPP.h -> RApp.h will do the trick as well. Otherwise, you can make the fix in your sources too. In the console view of Eclipse, switch to the one of Processor Expert. This is where the sources are located. so you could patch that source file directly. looks like a great project! I am just starting with the nrf24 modules and whonder what the status of your rnet stack is. yes, I have continued devloping the stack a bit, and added better integration and (hopefully!) made it easier to use. You can find the latest version of it on SourceForge: https://sourceforge.net/projects/mcuoneclipse/files/PEx%20Components/ as Processor Expert component. Thanks Erich for giving this link. I can definitely use Message Identifier while sending data from server to device. I wanted to check this code to understand things better but i am getting an error with freeRTOS component RTOSTICKLDD1. Please advice. Which project from GitHub are you using?